SOLD OUT of the XL in Camo. The XL is still available in Blaze Orange. The K9 Field Jacket is for the times when your dog needs a little extra warmth in the field while also providing superior protection from cuts, abrasions and punctures. The K9 dog vest is made from water resistant 1000 denier Cordura nylon outer shell for superior durability and protection as well as 100 grams of Thinsulate® for added warmth on those cold days in the field. 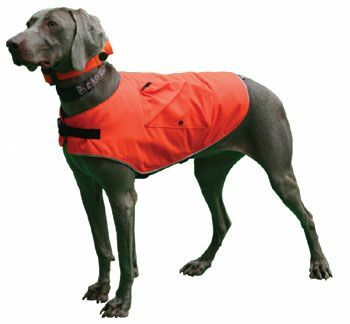 The cape style jacket fastens around the dog's neck, chest and stomach with adjustable nylon snap fasteners. Small 20"-24" 18"-22" 25-45 lbs. Medium 24"-28" 22"-26" 45-65 lbs. Large 28"-32" 26"-30" 65-85 lbs. XL 32"-36" 30"-34" 85+ lbs.